One challenge in my statistical consulting projects that involve survey data is how to deal efficiently with open-ended questions. One option is to be involved in the planning of the survey such that you minimize their use. A second option is to have an experienced “coder” on your team and let him or her sift through the responses and place them into nice, clean categories for analysis (I like this option). 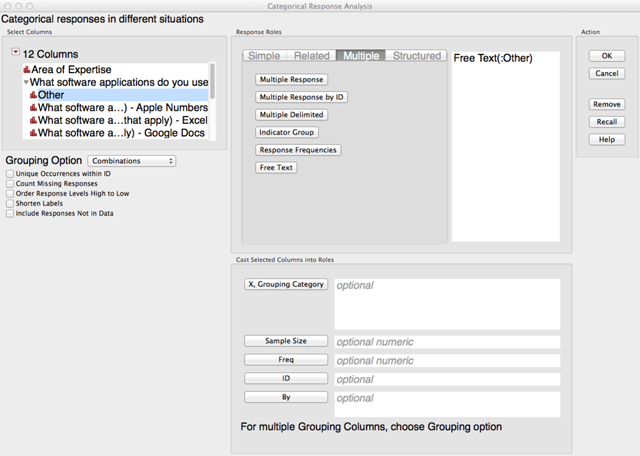 A third option is to use the new JMP “Free Text” option. I found this helpful for open-ended questions for which the responses were expected to be short (i.e., words), as opposed to long-winded narratives. 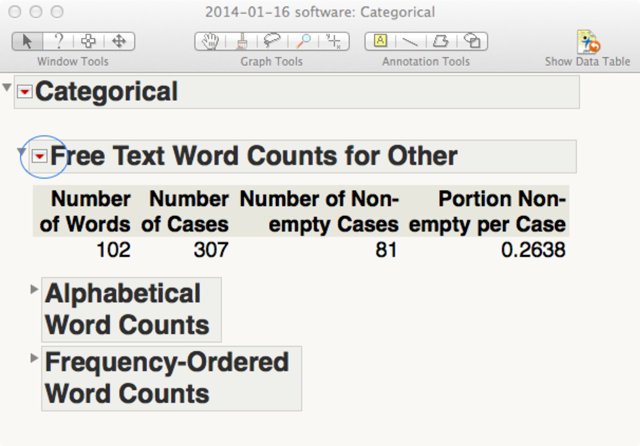 The “Free Text” command is an option in the Categorical platform within the Consumer Research platform (Analyze>Consumer Research>Categorical) and can be used to obtain the counts of all words appearing in a column (Figure 1). I analyzed a survey with the question: “What software applications do you use to analyze data? (Check all that apply)” where one option was “Other (please specify).” Our list of options included major software programs such as SAS, JMP and R.
I was interested in the Frequency-Ordered Word Counts. I could view them in the free text analysis, but I found that using the “Save Word Table” (red triangle menu) was useful in my analysis (Figure 3). This simple analysis of the other category found that we had missed four analysis packages that the researchers frequently used. I also applied the free text analysis to a question about search terms. For that analysis, I had to do a little extra work. I had responses such as “climate models, temperature.” The Free Text tool would count three words: climate, models and temperature rather then my desired two terms. I used Find and Replace to replace all spaces with underscores to obtain the desired words: climate_models and temperature (this could be fixed by allowing a user defined deliminator). The Free Text tool is a useful addition to the Consumer Research platform. We now have a way to quickly summarize simple open-ended responses. What about other applications of the Free Text tool? Who knows what data sets will find their way to my desktop next, so only time will tell.